At the TUC conference today there is yet another example of why the UK is going to be a difficult place to live in the next few years. 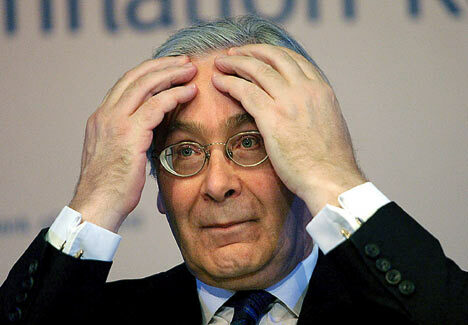 The Union bosses like Brendan Barber are itching to have a go at their guest, Mervyn King. The TUC see him as representing the Bankers and the City and therefore, with willful ignorance, hold him responsible for the recession. Mr. King for his part seems to wants to take his punishment by turning up - perhaps from his Ivory tower he thinks he can subdue the masses. Or more likely, Mr Osborne has told him that if the Bank of England is to become a super-regulator with all power to him, then a few small favours such as this must come out. The funny thing is, the Unions are right about Mr King, just for the wrong reasons. The Bank of England was too slow to raise rates in the boom years, fatally slow to drop them as the economy car crashed after Northern Wreck (they had a year to drop rates and did next to nothing) and then now are sat with failed models predicting decreasing inflation which is remaining stubbornly above target. The Bank of England have nothing to crow about in their response to the crisis, it has been very poor. Which all in all leaves us in a fine state. Mr King, wibbling about how he is going to turn the economy around without understanding what we really need (higher interest rates and more QE), whose default position is to not do much (see notes of the MPC meetings for the whole of this year, rabbit-in-the-headlights-paralysis). And the Unions, railing against reality - the coverage of the absurdities of public sector pay are laid bare across the media today. With such a lack of quality amongst these kinds of leaders in the Country, we are in for a bumpy ride. My belief is a whimper rather than a bang. Many of us were expecting to be wearing hair shirts and manning the barricades already but this hasn't happened. I expect much industrial action - including key workers such as myself - to begin with and for it to trail off as strikers struggle with mortgages. However much it goes against the grain it is going to take a brave man to oppose a strike innitially, so these could be highly effective at first. It would have made it so sooo much easier for me if I believed in my government. I don't think David Cameron is going to do much about immigration, crime or welfare abuse. So why should I stick my neck out at the horny-handed-sons-of-toil anti-Thatcherist branch meetings and conferences which I attend ? The light isn't worth the candle. I could go along with that - "higher interest rates and more QE", that is. E-K, I know where you are coming from. CMD is a sort of greenish, Westminster bubble inhabiting, liberal democrat, too frightened to take decisions opposing the EU, including on immigration. EK, sounds like you work with some right neanderthals. I work in local government and have never gone on strike, and no one has ever said jack about it. In fact, in the 4 years or so I've spent in LG, no one has ever even approached me and asked me to join a union. I'll quite happily walk through picket lines, and quite happily tell uniomns numpties why they are talking horsecrap if they try and stop me. A new study by the Office for National Statistics shows just how much thicker. Median gross weekly pay in the public sector is £539 versus £465 in the private sector. Add in pension contributions and the state pays £615 a week against £479 in the private sector. Can't increase rates yet though CU. That really will topple the applecart. Cuts first, growth rates need to be up to about 2% and then the rates increases, but still very gently. Doesn't that stuff the consumer with higher mortgage and loan rates while shoving extra free profit into the banks? Or will QE magically slash the retail interest rates just like it didn't do last time? The way we get out of this is the proper way, by working harder for less. It's not pretty but it is necessary. I doubt you wear a club tie or a union badge either, Steven. Neanderthal ? Surprisingly not. Some very sharp people who know the value of negotiating with a big stick behind the back. Most notably the amount of training and selection required (at least two years to become fully operational) to replace us. Richard Branson doesn't pay a person 50k basic with benefits and enhancements (70k in reality) for nothing. This is what the 'neanderthals' have managed to achieve. Not so stupid then. And worthy of my respect. This is before we even start talking about anything which resembles industrial action. And as for breaking strike ? My point was that DC has done nothing to earn such loyalty from me and everything to take it away. Well as far as I'm concerned Unison have achieved sweet FA that benefits me, they won't be getting a penny in subs off me, and I won't be losing a single day's pay to appease them. We have a professional institution to maintain professional standards, lobby government etc. They aren't perfect, but they do enough for me to warrant my subs. Unison on the other hand can whistle. All they did under labour was invite me to lectures about how wonderful Venezula and Cuba are, then as soon as the government changed they started sending me nonsensical propaganda aimed at getting me to help them restore the bankruptcy party to no 10. I'm a member of a major union. Yes to QE but no to how it has been done so far! Stuffing the banks with cheap dosh seems a bit daft to me. Giving fiat money to FTSE listed companies directly and raising interest levels to the same as CPI would have a much better effect. Those with investment opportunities could invest, others could pay down debt and others could pay it as dividends. I'd send an email, not a letter if you want to find out what your union is up to, BQ. Merv the Swerve sticks it to the TUC, but nobody has as yet stuck it properly to the bankers. Banker-sticking is one of the few things about which we have consensus...but all the Unions want to do is witter on about class warfare and wicked Tories. Thus the Guardian jumps on the ONS data as yet more evidence of Tory Nastiness. In fact, the data vindicate what Osborne is on about. QE, diluting the value of peoples money and giving the difference to bankers, is theft. This is why the TEA party was born in the US, to combat the statists / fascists who have taken over the so called 'right'. You have no moral right to alter the value of peoples money to cover the failed bets on property values a bunch of greedy fools made. The system still has a long way to unwind, and its not going to be pretty, such a big bubble was created that the usual government manipulation isn't going to work. In fact it amazes me that only a few years ago we were laughing at the stupidity of Robert Mugabe, yet now many economists are basically suggesting what amounts of the same kind of policies for this country.